Indra staff. Looking down on the row of Indra staff, and their server racks. Staff were instructed not to talk to observers. We had no way to know what they were doing, whether they were reprogramming the equipment or updating the database(s) on the fly - which problems later in the day suggested might be occurring. Also unclear whether their laptops, the servers, and the counting equipment around Olympia were all networked together, to City Hall, and/or to the wider Internet. Regardless of their instructions, they often seemed happy to talk, as long as they weren't busy. I asked several Indra people, and they all confirmed that there were no auditors from KPMG in the count centre. So whatever these Indra people were doing was not subject to oversight from KPMG. I can confirm that at least one person from KPMG was present at Olympia. He had a badge saying KPMG and confirmed that he was indeed from KPMG. I saw him numerous times throughout the whole day carrying his clipboard. He obviously wouldn't answer any questions about what he was doing or whether he was present for the audit or the stack of spare scanners. Stupidly, I didn't take his name. When I was at City Hall in the evening, I spoke to John who told me that the data from the counting centres were feed straight through to City Hall on a live link. That way both London Elects and Indra staff at City Hall knew exactly what was going on at all points in time and they had extra copies of all the data backed-up / recorded there. I also noted someone at Ally Pally with a KPMG badge, though I did not speak to him to confirm who he was. Yeah, that was me representing KPMG at Alexandra Palace. Fun times. Following the same Cat-5 cable. Two scanning machines opened to clear misfeeds. The faulty scanner is wheeled away. Scheduled cleaning of the scanner. These ballot boxes are properly sealed. Many ballot boxes were not properly sealed. 2nd level adjudication station - PC close-up. 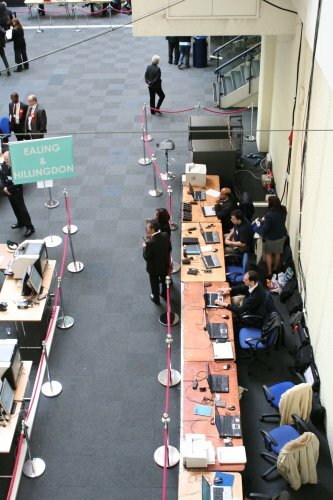 Scanning station, before the count started.